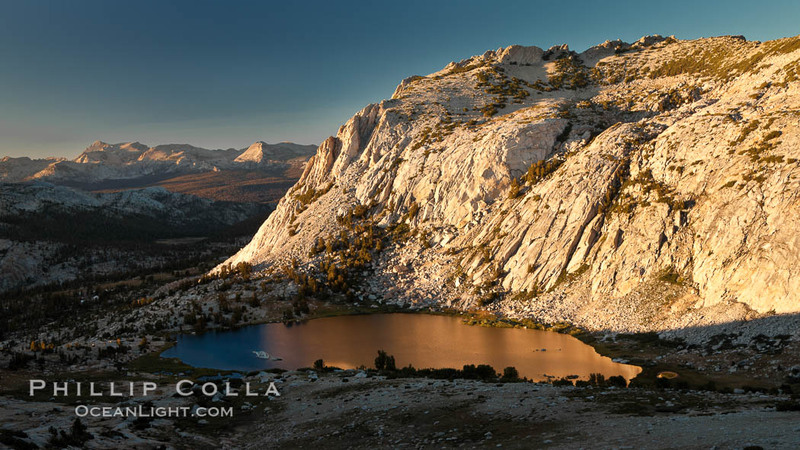 Tenaya Lake at sunset, panoramic view looking north, with Tenaya Peak (10,280′) on the right and Medlicott Dome (9,880′) on the left. 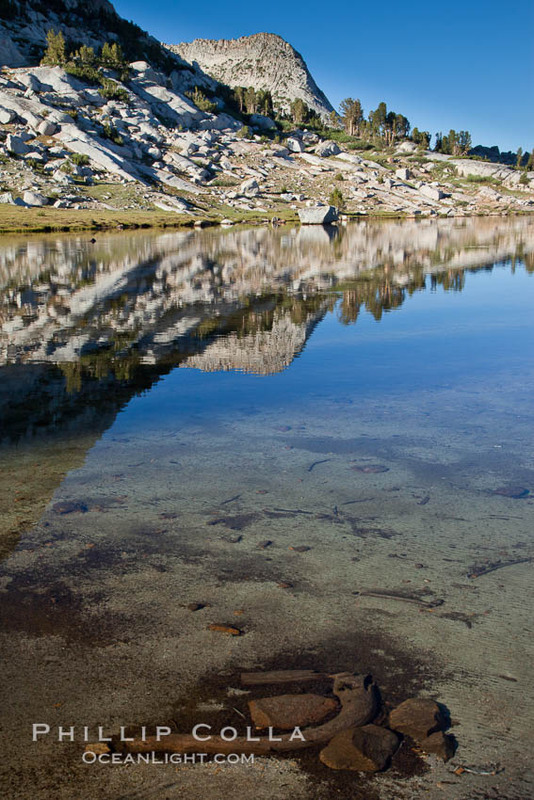 Tenaya Lake lies at 8,150′ in the heart of Yosemite’s high country. The following morning Dad chose to sleep in while I made a sunrise visit to Tioga Pass, a short ways up the road from the Tuolume Meadows Lodge. I was hoping to see a bear or some deer, but I had to settle for reflections of Mammoth Peak in the small tarns that are found in the meadows near the pass. 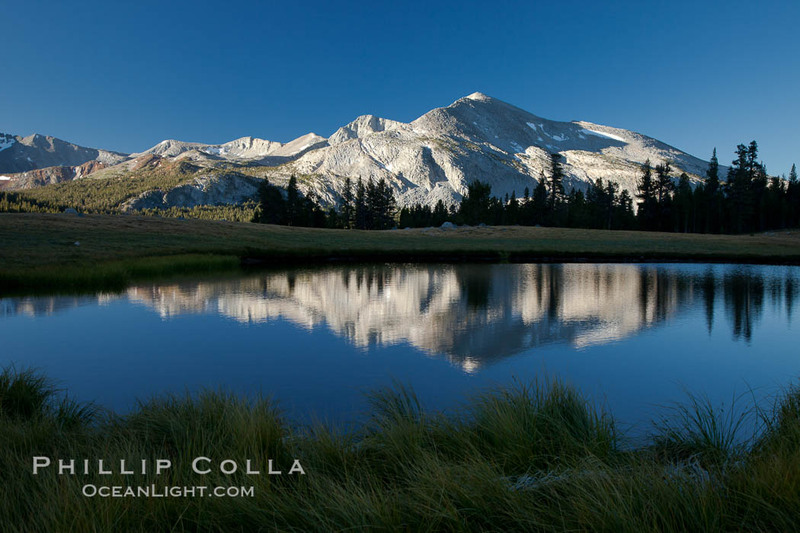 Mammoth Peak (12,117′) reflected in small tarn pond at sunrise, viewed from meadows near Tioga Pass. We hit the trail after breakfast, choosing the Rafferty Creek route to Vogelsang. Although frowned upon by some as a pack trail, Rafferty Creek is a much shorter approach than the Lyell Canyon route and my dad, at 74 years, was not sure how his legs and back would feel about long route. It must be said that one advantage to taking Rafferty Creek Trail is that the bulk of the uphill work is done in the first 3 miles, with the last 4 miles being mostly not-too-difficult uphill slope through a pleasing series of meadows and forests. The hike took a while but was not particularly challenging, Dad being prepared and well-conditioned by a month of long pre-trip walks. We reached Vogelsang with little fanfare by about 3pm, just in time for siesta. We were lucky to receive one of the two person tents alongside the creek. And to top it off, there were no mosquitoes, it being too late in the season for the carniverous demons to practice their injurious profession upon my tender flesh. Panoramic view of the Cathedral Range from the summit of Vogelsang Peak (11500′). The shadow of Vogelsang Peak can be seen in the middle of the picture. After a recumbent hour I remembered that one of my goals was to bag Vogelsang Peak, one of the two 11,500′ peaks that overlooks Vogelsang High Sierra Camp (the other being Fletcher Peak). I asked the camp manager to set a plate of dinner aside for me while I made a sunset hike to the peak, and she kindly complied, so I took off about 5pm. I encountered noone on the way up or down except for a few marmots. The route is not technical, being characterized as “pedestrian” in one online account I had read. I reached the top about an hour before sunset. What a view! My panoramic photo above (click it to see it larger) really does not do it justice. I really love those brief moments atop a summit, any summit, and this was no exception. 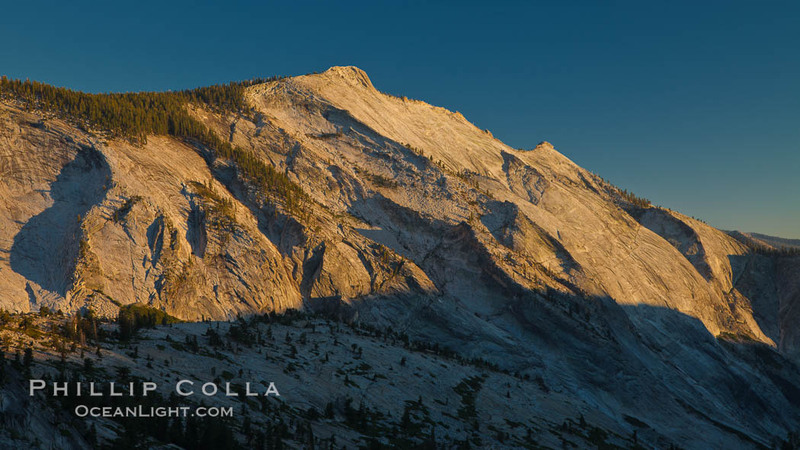 I savored the lingering light as it lit the scene all around me, the Cathedral Range to one side and Half Dome in the distance on the other, alone atop this impressive granite height. The sun was still warm enough that my t-shirt was all I needed. There was no wind. The lengthening shadow of Vogelsang Peak pointed toward Bernice and Gallison Lakes and several peaks of the Cathedral Range, including Amelia Earhart peak, Parsons Peak and Simmons Peak, all about 12,000′. As one is wont to do when one finds oneself alone in a place of serene quiet and moving beauty, I pondered deep thoughts for a while. But not for too long, as I do not have the intellect of a philosopher. I ate my snack bar, recorded a bit of video, signed the peak register I found hidden in an old ammunition can among the rocks, and started back. On my way down to camp I was treated to a gorgeous view of Fletcher Peak reflecting a wash of gold across Vogelsang Lake. I gratefully wolfed down my dinner as I described the hike to my dad, then washed up and hit the sack. It was about a 10 mile day with almost 3000′ of elevation gain for me, so I slept well! Fletcher Peak is reflected in Vogelsang Lake at sunset, viewed from near summit of Vogelsang Peak. Dad let me take off before sunrise for some photography, so I walked up to Townsley Lake and made some exposures in the mirror-smooth waters. The German grad students who shared our dinner table in Tuolume mentioned that Vogelsang means “bird song”. On this very still dawn at Townsley Lake, where the only sound that broke the silence were bird chirps, the camp’s name seemed particularly apt. 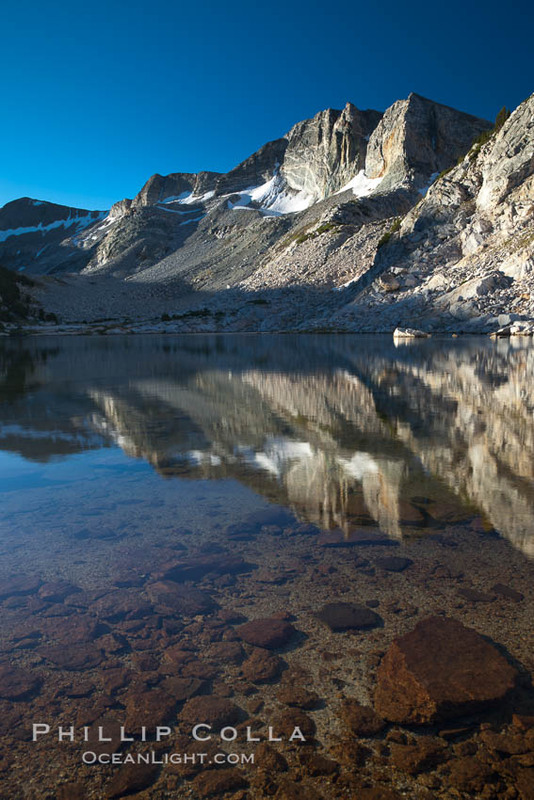 Fletcher Peak (11410′) reflected in Townsley Lake, at sunrise, panoramic view. Hanging Basket Lake (10601′), with Fletcher Peak (11410′) rising above on the right, panoramic view. We continued our hike up to the meadows above Townsley Lake. We met a few more marmots, and found a toad in the grass. On the plateau above Townsley and Evelyn Lakes, we wandered by a series of beautiful tarn ponds. Several of them, not connected to any streams and thus safe from introduced stock trout, were absolutely plugged with tadpoles. As we walked along the edges of these ponds the tadpoles would splash through the shallowest few inches toward the deeper middle of the water. Other ponds were connected by a stream, being part of the drainage to Evelyn Lake which was our destination. Purple lupine flowers were blooming in abundance along the this stream, and we found a group of deer. We descended the slope to Evelyn Lake, reaching the sand beach along the western shore. We went for a well-deserved swim. The water was bracing but we dried off almost immediately in the warm weather and felt great afterwards. After Evelyn Lake, a few more miles took us past a couple of meadow-bound tarns, back to Fletcher Lake and once again to camp, After another fantastic meal, we spent our second night in Vogelsang Camp. Reports had been circulating on the internet prior to our trip that Mars would be making its closest approach to Earth in recorded history during our stay at Vogelsang, but I have since learned those reports were, in the usual internet-driven fashion, fanciful. Nevertheless, Mars was indeed quite bright each evening, following a few degrees behind the full moon as the two traversed the night sky. Both Mars and the full moon looked down on me as I made my way up the short walk to Vogelsang Lake before dawn on our final morning. I recorded a time-lapse video of the sunrise breaking over Vogelsang Peak and sweeping down to Vogelsang Lake, which can be seen briefly at the beginning of this video and in full at the end of the video. Indeed, both Mars and the moon appear in the beginning seconds of the time-lapse, at the far right, but Mars is admittedly difficult to discern in the Youtube version. The video was an experiment to test out a external microphone on my camera, and to learn a little bit about recording video with an SLR still camera. You can see it with some comments at my earlier post about it. Our second and last morning at Vogelsang Camp was relaxed and uneventful. As it was yesterday, this morning was warm, still, quiet and mosquito-free. We enjoyed another excellent breakfast, of the sort that breakfast afficionados such as myself record in our life list of notable breaking-of-the-fast achievements. There is something particulary satisfying about eating hearty food in spectacular outdoor surroundings. I feel justified in enjoying seconds of everything, rationalizing (hoping?) that I will burn the additional calories on the coming day’s hike. Vogelsang Peak (11500′) and the shoulder of Fletcher Peak, reflected in the still morning waters of Fletcher Lake, in Yosemite’s gorgeous high country, late summer. We returned via the Rafferty Creek trail, reaching the car in Tuolumne Meadows by about 1pm to began the long drive down 395 to Southern California. Wouldn’t you know it, the clouds which were totally absent during our time in the high country appeared just as we reached the end of the trail!